Jungle Shuffle – CGI Feature announcement by Fred Patten. Tip: Courtesy of Ace Eldritch. Okay. 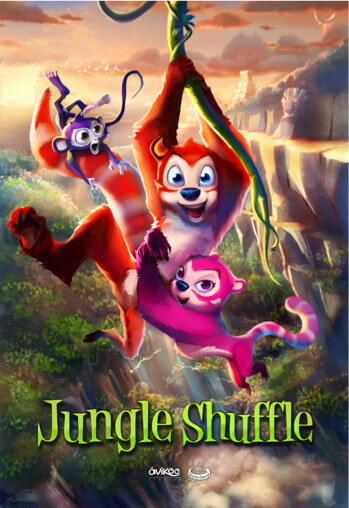 Jungle Shuffle, or The Jungle Shuffle, is a 85-minute computer generated imagery (CGI) animated feature, with coatimundis, not red pandas. It was a South Korean and Mexican co-production, directed by Taedong Park and Mauricio de la Orta. The plot: in 1960 in the dense Lacedon jungle in southern Mexico (the Mayan area), Manu (boy) and Sacha (girl) are two coatimundis in a village tribe led by Sacha’s father. Manu is a typical loner, barely tolerated by anyone but Sacha. Manu’s rival for Sacha’s paw is Artex, a smarmy wise guy who is really trying to become the chief’s successor. Artex persuades the chief to have a big protective totem made to scare off the humans who are starting to invade the jungle. Manu accidentally destroys the totem, and is banished from the coati’s village to live alone in the jungle. 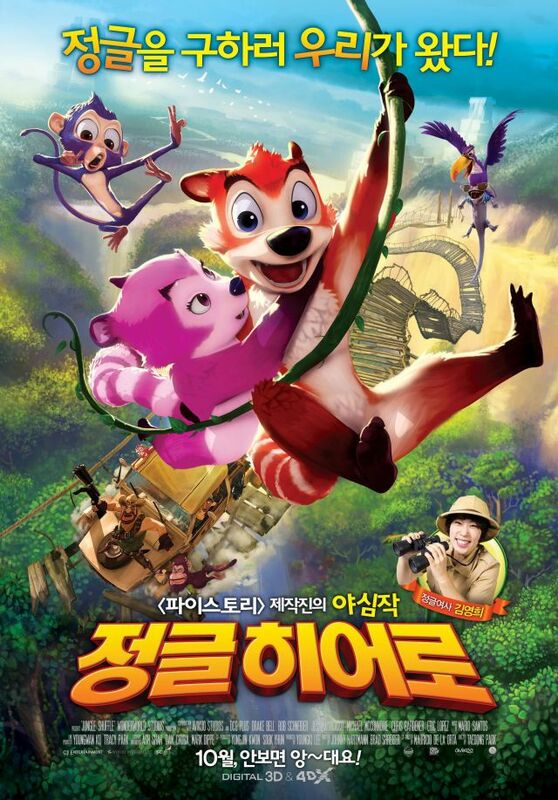 When Sacha is captured by the human hunters of Profesor Loco (who is conducting experiments with captured local animals to develop a super-chicken), Manu tries to rescue her; but he runs into Balaam the jaguar, whose mate Kim has also been captured. Manu and Balaam get in each others’ way, resulting in Manu making another enemy. But Manu does mange to rescue a monkey, Chuy (a comic-relief wannabe kung-fu fighter). Together the two manage to rescue both Sacha and Kim, and Manu becomes everyone’s hero. Production began (developing the story) at Avikoo Studios, where it was known as Las Aventuras de Manu, in 2001. Technical production began in 2004. The finished feature was peddled successfully at the February 2014 Berlin Film Market. My first reaction after reading this synopsis was to wonder, didn’t we already see this in the 2008 Spanish animated feature The Missing Lynx? The animals are amazingly neon color-coded, from Manu’s bright orange to Sacha’s bright mauve to Artex’a bright Prussian blue (and the studio must have really worked to make Prussian blue bright) to Chuy’s bright purple. 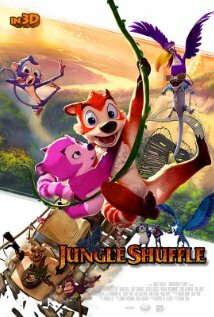 The decision to feature coati mundis does bring an exotic animal to animation; one that’s so little-known that one American review of Jungle Shuffle refers to Manu as a “Coati monkey”, which is like calling ferrets rodents or bats big bugs. The animation quality: see for yourself. The bottom line: although I have not seen Jungle Shuffle, I gather that I and you haven’t missed much. There will doubtlessly be an American DVD release eventually. Since it hasn’t sold in America yet, the entire movie is available online, although it will probably be taken down when an American sale is made. Until then, enjoy if you’ve a mind to. Here are live-action videos of red pandas and coatimundis. Decide for yourself which the animation in “Jungle Shuffle” looks more like. I just noticed that the video of coatimundis identifies them as a “tropical raccoon”. Both coatimundis (Central America) and red pandas (Southeast Asia) fill the ecological niches that raccoons do in North America, but that doesn’t make them raccoons. There are also the tanukis of Japan, which look and act very much like raccoons but are more closely related to dogs. August 27, 2015, and the whole movie has been taken down from the Internet; by which I assume that an American for-kiddies DVD release is coming soon. I managed to see the entire “Jungle Shuffle” before it was taken down. Nope, you’re not missing much, although I didn’t feel that I wasted my 85 minutes. The best scene, crossing the bridge in the jeep, is still online. If you do want to see a CGI movie with a very similar plot, seek out the Spanish “The Missing Lynx”. And the cute animals still look more like red pandas than coatimundis to me.